QuickBooks has a setting that lets you fine-tune the service connection. 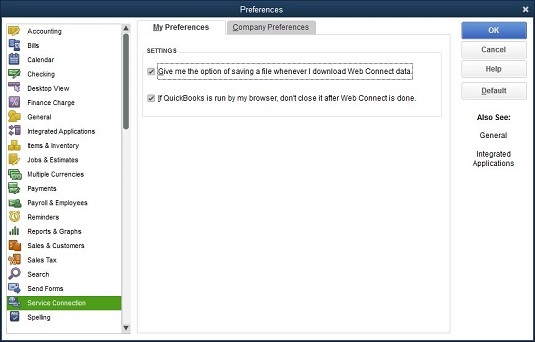 The My Preferences tab of the Service Connection Preferences dialog box provides two check boxes you can select to control how QuickBooks works when you’re making web connections. One check box gives you the option of saving downloaded files. The other tells QuickBooks not to close your web browser when it finishes using the web. The My Preferences tab of the Service Connection Preferences dialog box. For the Service Connection Preferences dialog box, two Company Preferences options are available. You can, for example, indicate whether QuickBooks should automatically connect to QuickBooks Services without asking for a password or whether it should always ask for a password.